This formula is almost self-evident (if you take the time to think about it)! GDP is a measure of all the goods and services produced domestically. Therefore, to calculate the GDP, one only needs to add together the various components of the economy that are a measure of all the goods and services produced. Many of the goods and services produced are purchased by consumers. Therefore, what consumers spend on them (C) is a measure of that component. The next component is the somewhat mysterious quantity “I,” or investment made by industry. However, this quantity is mysterious only because investment does not have its ordinary meaning. When calculating the GDP, investment does NOT mean what we normally think of in the case of individuals. It does not mean buying stocks and bonds or putting money in a savings account (S in the diagram for Exercise 1, below). When calculating the GDP, investment means the purchases made by industry in new productive facilities, or, the process of “buying new capital and putting it to use” (Gambs, John, Economics and Man, 1968, p. 168). This includes, for example, buying a new truck, building a new factory, or purchasing new software. This is indicated in the diagram by an arrow pointing from one factory (enterprise) to another. In essence, it shows the factory “reproducing itself” by buying new goods and services that will produce still more goods and services. NOTE: There is a money-flow relationship between personal savings, S, and investment, I, but this does not figure directly in calculating the GDP. See Exercise 3 below. You may see the formula for the GDP written this way, and it may be easier for you to remember in this format. 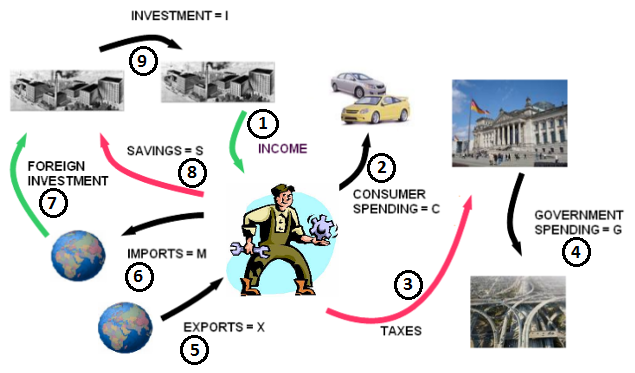 The final component is G. The government buys (with your tax money) goods and services (G). These purchases are a measure of those goods and services produced. Be aware that many people make the mistake of thinking that the money paid in taxes and spent by the government is “lost” and therefore subtracts from the GDP. Tax money may indeed be spent inefficiently but this fact has no bearing on the calculation of the GDP. Study the diagram below. Be sure you understand how the total income and expenses of Joe Worker ultimately make up the Gross Domestic Product. Joe Worker receives a salary from his place of work, as well as additional income from other work, stock dividends, and interest on savings. Joe spends most of his money on personal consumption, which includes not only purchasing items such as cars, food, and clothing, but also making rent and utility payments, paying for monthly consumer services such as phone and cable, covering health care costs, and even contributing to charity. All of these expenses fall under the broad category of “Consumer Spending” when used in calculations of the GDP. These expenditures comprise about 2/3 of the U.S. GDP. Joe pays a substantial portion of his income in various local, state and federal taxes. These taxes can vary considerably. Federal income taxes, for example, range from about 4% to 26%, depending on total household income – see the Taxes Game). The money that Joe gives to the government to spend on his behalf converts some of Joe’s labor into substantial public goods such as roads or schools that contribute to the Gross Domestic Product. The Government expenditures (“G”) in the formula are therefore added to the GDP. In recent decades, federal government spending has comprised from 18% to 23% of the U.S. GDP. If Joe helps produce soybeans, computers, or medicines that are sold overseas, the items he makes count as exports. But the money received in payments for these items comes into his country (the direction of the arrow in the diagram shows the money flow into Joe’s country). This money is added to the GDP. Imported items count in just the opposite way: money is leaving Joe’s country. When raw materials, such as oil or chemicals that are used in the manufacture of finished goods are imported, these costs are subtracted from the GDP. [Note: The cost accounting is different when Joe shops at Walmart. Since many of the items he buys at Walmart are imports these count as “consumer spending,” increasing the GDP but also count as imports, decreasing the GDP by the same amount. In other words, buying an imported finished good does not change the GDP because nothing new has been produced in Joe’s country.] In recent years, U.S. imports have exceeded exports, resulting in about a 2% reduction in U.S. GDP. Foreign countries receive funds when Joe Worker buys their products. But these countries also invest in Joe’s country (the U.S. in our example). For example, they may buy shares in public companies. The result is that the outflow created by the by the purchase of imports is balanced by an inflow of investment money into the U.S.
Joe still has a little left over to put into savings and to perhaps to purchase stocks or mutual funds. Although not part of the GDP calculation, this money contributes indirectly because it contributes to the supply of money banks and money managers have available to support corporate investment. Banks and money managers use Joe’s money to lend to corporations or to buy stock in corporations, which the corporations use to make new “investments” (“I” in the formula), such as a new factory, or any other means of substantially expanding or improving their business. Let’s look at the role played by personal savings. The diagram indicates that personal savings (what we normally call “investment”) is actually a source of revenue for industry. This is because the money you put in the bank is loaned to businesses so that they can put it to work. The bank system uses the personal savings of individuals to give industry its reservoir of money to work from. This is why economists say that the amount of Savings is always going to be approximately equal to the amount available for Investment. Savings and Investment can become out of balance when there is more demand for investment money than what is available from domestic savings. In that case, more money is borrowed from foreign sources. Because additional Savings has the effect of supplying more money to industry, some economists have argued that if we want to correct the negative effect of the trade deficit (since it is subtracted from the GDP), we should encourage Savings, which will indirectly boost Investment. At this point, you should be able to answer the following questions. 1. What portion of the U.S. GDP is accounted for by Consumer Spending? 2. What percent of the U.S. GDP is “lost” or subtracted from the total due to the trade deficit? 3. How does the money “lost” due to the trade deficit find its way back to the U.S.? 4. How is “Investment” defined on the diagram? Are you confident about your answers? Check yourself with the Money Flow Quiz! Atoll K is a small island nation. Its population total is 400, and it has 100 wage earners who earn an average of $50 per year. Each wage earner spends a total of $40 per year buying goods and services of which $3.00 goes to buying imported goods. The island exports a total of $800 worth of goods. The Government tax rate is 10% and all government money is spent on building infrastructure and supporting schools. There is only one industry (uranium mining) on the island and it employs every wage earner. The industry spends $600 each year on new mining equipment. What is the GDP? Check your answer with the GDP Calculation Quiz! In this example, we shall use the actual GDP figures for the U.S. in 2000. The U.S. Government Printing Office has historical data for the U.S. from 1959 to the present. Click HERE to open the link to the GPO page with the data for GDP 2004. On this page, click on the link for the PDF file for Economic Report of the President (2004). This document, named “ERP-2004,” is quite large (416 pages). Go to the entry for Table B-1: Gross domestic product, 1959-2003. The table is spread over two pages: pages 284-285 of the document. Carefully review the entry for the year 2000. If you are adept at moving data and eliminating unnecessary information, you can generate a chart like the one below simply by editing the government-supplied chart. Notice that the GDP calculation in the chart uses the same headings we gave above in the formula for the GDP. Our example calculation, made by plugging the chart entries for the year 2000 into the formula is shown below. Anthony Birch, Ph.D. has taught Business Ethics, Introduction to Ethics, Contemporary Ethics, and Introduction to Philosophy at a number of colleges and universities. He is the co-author of How to Ace Your Online Course, available at Amazon.